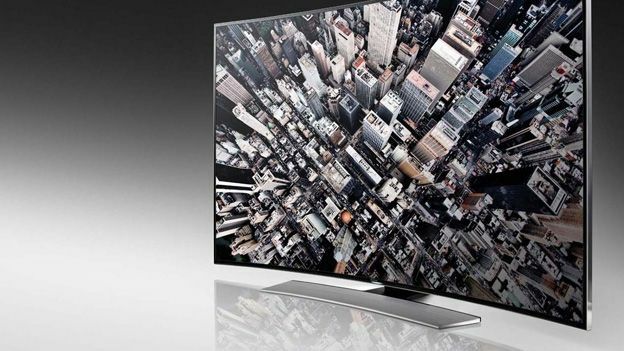 With its dramatic curved screen, the next-gen Samsung UE65HU8500 UHD TV rewrites the 4K rulebook. Samsung has a barrage of reasons why your next telly should bend like a pucker cinema screen (it's more immersive, seems panoramic etc), but the bottom line is it just looks dang cool. Its prime 4K rivals include the Panasonic TX-65LWT600 and incoming AX802 4K sets and the Sony X85 and X9 line. The 65-incher reviewed here is joined in the range by the 55-inch Samsung UE55HU8500 and 78-inch Samsung UE78HU8500. When it comes to functionality, the HU8500 is richer than Warren Buffett. The latest iterations of the brand's motion and voice control are here, along with changes to the UI, which now includes a slate of casual games and split-screen Multi-View. There's even an Advanced Soccer mode, which announces itself with a crowd roar (only mildly irritating). More significantly, this is also the first UHD screen to land with an HEVC decoder, compatible with Netflix 4K. There's no doubt that those curves are a head turner. The TV is actually deeper than you might imagine at some 40mm, but the bezel is a trim 13mm. Not content with playing Uri Geller, Samsung has also redesigned the remote into a pebble-shaped Bluetooth oval, which combines a touch-sensitive pad with gyroscopic control and a limited Hot Key button selection. The screen itself is devoid of AV inputs. Instead, these have been relegated to the separate Smart Evolution One Connect tuner and interface box; all sources connect here. Inputs include terrestrial and satellite feeds, four HDMIs (with 2.0 support for high frame rate 4K and MHL 3.0 for mobile devices), Ethernet, a trio of USBs (one USB 3.0), component via an adaptor and CI slot. The unit also boasts high-speed IEE.802.11AC Wi-Fi. Taking this modular approach futureproofs the set, says Samsung. This box is tethered to the screen with a single fat cable, which also provides power. Image quality is undeniably good. Nifty picture processing delivers stunning detail with enormous contrast. Full HD content is upscaled to 2160p and benefits from the panel's lack of visible pixel structure. The set really comes into its own with native 4K content. During our audition, the only 4K programming available was House of Cards Season 2 on Netflix, but this proved absolutely revelatory (fast broadband required). If you're expecting native 4K to offer only a small leap in image quality, then prepare to be amazed. The definition jump is huge. As for that curve, you pays your money etc. In truth it offers little extra beyond physical drama – and some unpredictable reflections. Audio quality is pleasingly fulsome. With its innovative curved design and leading-edge spec, this advanced 4K UHD screen from Samsung demands to be seen. With native 4K streaming content, image quality is simply sensational. Colour vibrancy and dynamics are extraordinary. The panel's upgraded processing power also makes for slick, speedy connected experience. In truth, we've yet to be sold on the curved panel itself. There's a definite viewing sweetspot and onscreen EPGs look a little wonky. Still, that won't stop this being one of the most talked about TVs of the year. We'd like to give it five stars for sheer audacity, but it's hard to recommend as a must-have when there's so little 4K content about and the fact that you really need to be sitting dead centre to get the full benefit of the curved screen.